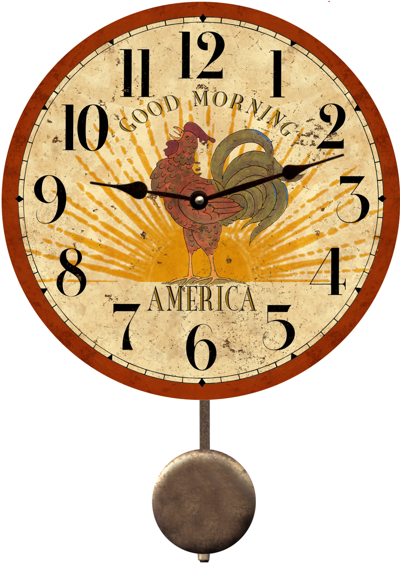 Our Primitive Rooster (Shown with Pendulum) is available in 6 variations shown below. Designed by well known folk artist Maurice Dallas Sr.
our Primitive Rooster adds a unique Primitive look to any room in the house. It reads "Good Morning America". Our Primitive Rooster Clock was designed by well known Folk Artist Maruice "Mo" Dallas Sr. To view his line of Limited Edition Wooden Noah's Arks click the thumbnail below. "Primitive Rooster " Shown with pendulum option. TO THE LEFT BEFORE MAKING PURCHASE.